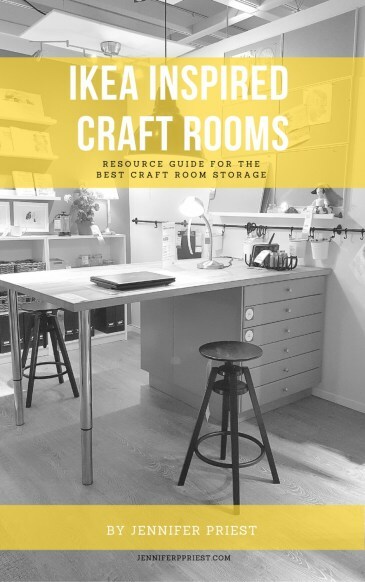 This post is sponsored by Crafty Hangouts and their advertiser, ConsumerCrafts.com. All opinions and ideas are 100% my own. Is your family absolutely Star Wars obsessed?! With May the 4th around the corner, it's like Christmas all over again in our house. For Christmas we got Star Wars Legos, Star Wars pajamas, Star Wars beer coozies, Star Wars socks, and cooked a Star Wars turkey. Okay, maybe not the turkey but you get the picture that the Star Wars mania in our family is NOT wearing off any time soon. I received a shipment of soap making supplies from ConsumerCrafts.com and I knew I was going to make DIY Star Wars soaps. Just because I CAN. And you can too! Star Wars merch is awesome but when you can DIY a Star Wars goodie, that's even better!!! And these soaps are super easy to make with the kids. My son Matthew from Matthew's Crafts and I made these soaps on our Saturday Morning Crafts show; every Saturday morning around 9 am we make a craft together. It's a fun time to turn off the TV and bond over creating something with our hands. He absolutely loves this time together and I bet your kids would too … join us on the Smart Fun DIY Facebook Page on Saturday mornings! Cut the glycerin soap block into cubes, following the score lines on the soap, about 3 cubes per soap block. Place the soap cubes into a glass bowl. Place the bowl of soap in the microwave. Heat for 30 seconds at a time until the soap has liquified. Carefully remove the hot bowl from the microwave with oven mitts. Place a toy in each of the sections of the soap mold. Pour the hot soap over the toys to cover. Fill each reservoir to the top. Pop any bubbles on the surface of the soap. Allow to cool for 20 to 60 minutes. Pop the soap out of the mold and enjoy! 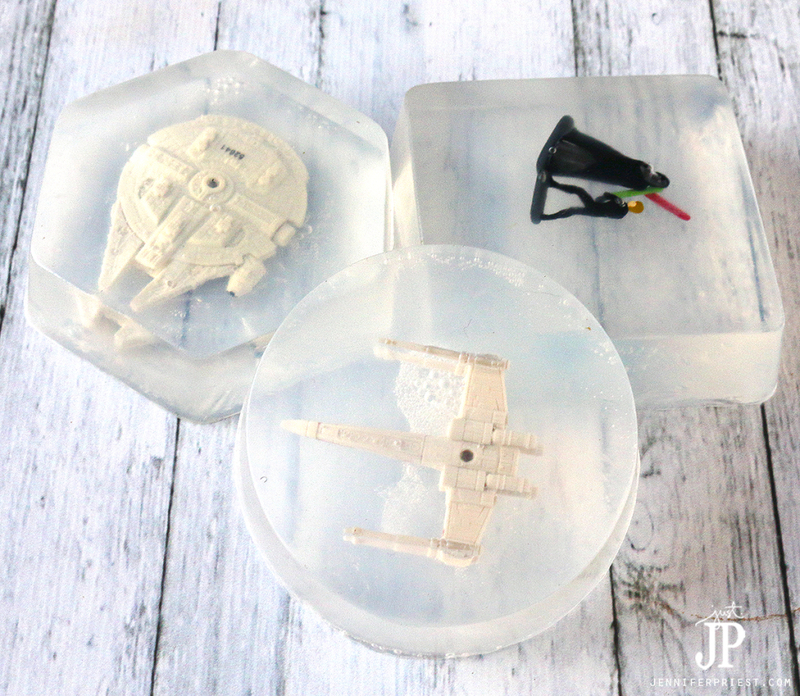 These DIY Star Wars soaps make great party favors, stocking stuffers, or gifts for any Star Wars fan. If you have kids who don't like washing their hands or taking baths, these soaps can help encourage them to get cleaner. That's the only way to get the prize inside! You can wrap the soaps individually in plastic bags, tying shut with a ribbon or twine. The kids are gonna love these so much you might find yourself asking to wash their hands LESS! Ha! Who would you make these for? Let us know in the comments! What is a vlog? Come check out Jennifer Priest’s new vlog! What a cute idea! 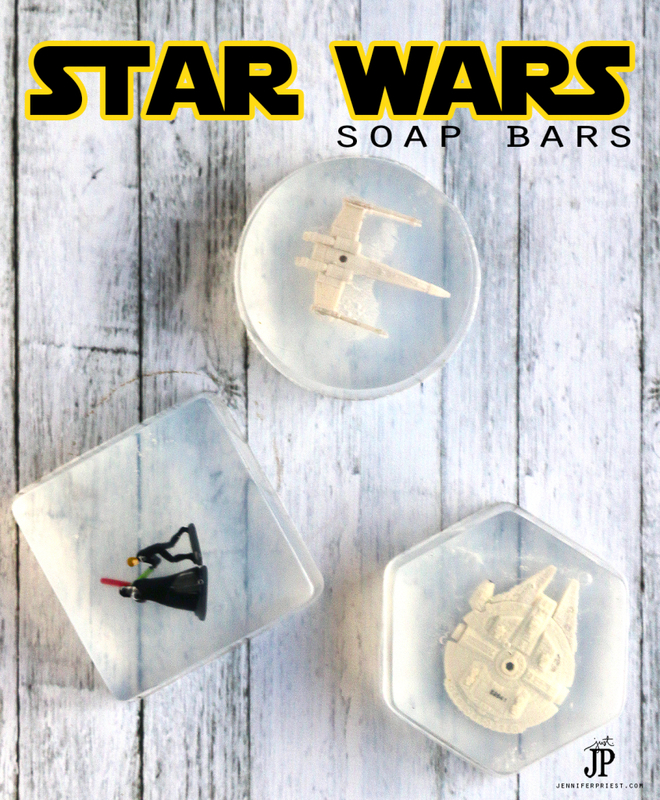 Yes, Star Wars mania has definitely invaded your home but that’s okay because the soaps are cool! And after the soaps are used up, you still have the awesome micromachines to play with or display. Win-win! These are great! My daughter (newly obsessed Star Wars fan) will love these! Thanks for sharing! What an awesome craft to make with my Star Wars loving boys! It just might get them to take a bath too!